For the original article by Rebeca Brandão in Portuguese published by Agulha on May 24 click here. Today, I would certainly prefer to write about the punks from Mesquita and the construction of an ideal of youth in the 2000s; about the recentralization of the city through symbolic assets in the West Zone, such as Zona Onírica; or perhaps about the exodus of independent Carioca cultural producers to São Paulo in recent years, and how that reminds me of Brazilian nationalists in Miami. But at this very moment, I’ve been struck by the news of Rafael Braga’s conviction–the first and only one convicted from the June 2013 protests–to 11 years in prison. All this because he “carried” one bottle of Pinho Sol detergent and another of bleach, with which he worked at stoplights as a windshield cleaner. His mother, Dona Adriana, still lives with his family in Complexo do Alemão (North Zone), which was also the scene of a civil war scenario this week, like almost every other day in the majority of Rio’s favelas. Thus, with the mission of reflecting on culture and city in this column, it seems incontrovertible and urgent to talk about Rafael Braga’s condemnation, about State terrorism and, above all, about how we only know about the daily war in progress in this city because every favela resident is a war correspondent. Ana Paula Lisboa wrote in her column, for O Globo‘s Segundo Caderno on November 23, 2016, that “every favela resident is a war correspondent and, worse, unable to leave and return home, nor to avoid that area.” In it, Ana, who lives in Maré (North Zone), reported the most frightening days in the suburbs and favelas of Rio de Janeiro in recent years, last November. But if I could bet, I’d say you have no idea what I’m talking about. What was underway was to be expected: an unfolding of the failure of the “pacification” project in the favelas, coupled with the (re)takeover of the morros (hills) by rival drug trafficking factions. That same week, residents of Maré and Cidade Alta (North Zone) and City of God (West Zone) experienced days of uncertainty: besides the trail of blood and death that remained in the alleys and passageways, houses were invaded, residents were displaced and entire families needed to “take some time” away from their territories. I will never forget the account by Vivi Salles, poet, activist and City of God resident, when on the day of the Street Corner Poetry Soiree’s 5-year anniversary, during a police operation, a police helicopter crashed in the favela. It was Vivi who was on the frontline and was the first person to report the helicopter crash, which then became international news. The anniversary didn’t happen, very much to the contrary, a war started from that point. 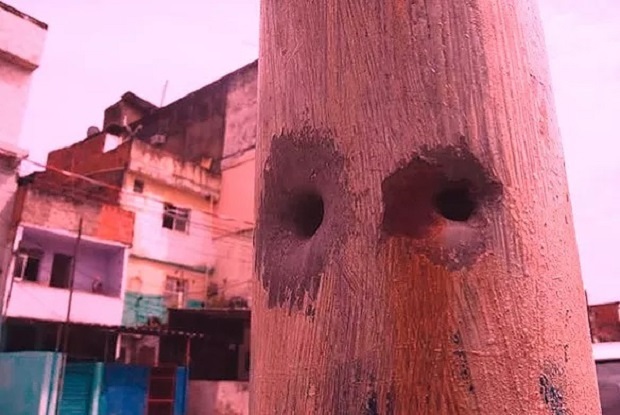 Last week, when Rafael Braga was convicted, another operation was underway in Alemão: with the mission of placing an armored booth in the middle of the favela, the police illegally evicted residents and made their homes into “operational bases.” There were six dead in ten days. The region was left without electricity, as the trucks carrying the booths ripped off the wires along the way. I wasn’t there to see it, and I didn’t get this information through some large news outlet. At the frontline of coverage and mobilization was Raull Santiago and Coletivo Papo Reto. It’s not like we don’t know that Facebook is a bubble, but when the only representative of the State within a territory is a militarized body, it’s every citizen’s duty to seek more legitimate sources than those that only report police numbers. There is a body behind every story and every picture, and if this is an institutionalized aesthetic language for Cinema Novo, why wouldn’t it be for community media? It was the independent media, with an idea in mind and a cell phone in hand, that was responsible for narrating the 2013 uprisings. On the (urban) periphery, communication is an exercise in survival: it is residents, business owners, moto-taxi drivers, all gathered in WhatsApp and Facebook groups, reporting in real-time what happens every day. Videos made on cell phones, images produced by a body that reports while trembling. It’s too tempting, but we do not subject ourselves to the drones, to the plans of televised coverage that were made at a “safe” distance and with a bulletproof vest. Finally, in order that this publication doesn’t reproduce the virtual bubble of our affections, I recommend that the reader periodically seeks to inform himself through institutions and collectives such as the Agência de Notícias das Favelas, Jornal Voz das Comunidades, Coletivo Papo Reto, Jornal Fala Roça, Fala Manguinhos, PPG News and even the Crime News blog, which offer a consistent and subversive look at the other side. If you are not a favela resident, be a war correspondent when the war comes to you. Remember that many Rafael Bragas, when not dying in the street or in jail, die from being forgotten. P.S. At the close of this edition, Cidade Alta is still experiencing the unfolding of the war that began in November. The Red Command faction, in an attempt to resume control of the traffic in the favela, stopped a good part of the suburb and access to downtown, having burnt buses and trucks carrying merchandise. This time everything was reported exhaustively in shifts that repeated a sequence of images, where armed men circulated in gangs. Fear took over the city. This article was written by Rebeca Brandão, and published on June 16, 2017.